Want to learn something new? Take a class, watch a demo, or just hang out and create something awesome by yourself or with friends. Get side-by-side assistance while you shop for supplies. Take a test drive! We have all the best sewing machine brands in one place, plus a dedicated sales team and financing to help make your purchasing easier. You dream it, we do it. We offer in-store mending, alterations, embroidery and other sewing services. In a rush? Park in a designated spot, call the number on the sign, and we'll bring your online order out to your car! THINK BIG with coupons PLUS 5% rewards on every purchase. Want to learn something new? We have classes for all skill levels of quilters, knitters, Cricut crafters, home decorators, and more, where you'll learn techniques to apply to future handmade projects. Browse Classes for more information. Make progress on your works-in-progress during our Open Studio hours. Use the space on your own or with a group of friends! Plus, rent the tech & tools you need to make your project easier, including sewing machines, long arm quilt machines, Cricut Maker, Cricut Air, Cricut EasyPress, Cameo Silhouette and Glowforge machines. Prices vary. This space is perfect for all kinds of parties! Work out a supply list with a Team Member and get 20% off your total purchase when you book your event. Pricing varies. The Creator's Studio is a FREE neighborhood gathering space for Iocal groups to hold meetings, host speakers, or other community events. Call your Store Coordinator to check the schedule & make a reservation. Let us help you craft a perfect party for your child! Select from several party themes & projects, and we'll provide an instructor, crafting supplies, setup and cleanup, and even a special gift for your child. You just bring the cake! Contact a Team Member to start planning. 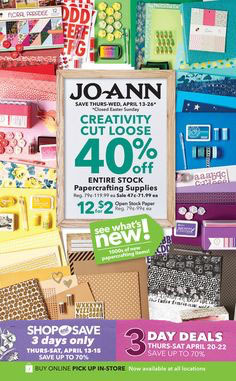 Your JOANN store in Columbus has an on-site custom framing department. 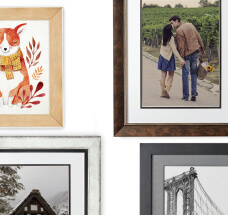 Our framing experts provide white-glove service from start to finish, helping you turn treasured artwork, photos and more into long-lasting keepsakes. We use only the finest conservation-grade materials and trend-right frames to handcraft heirloom-quality gifts and artwork. Most orders are completed within two weeks. Hello, My name is Jaime Bennati. I am a 9-12 art educator. I teach a fashion design class to a group of primarily junior and seniors. I came up with the idea this year to bring them into a Joann’s to learn how to pick out fabrics and accessories for their work in the course. I wanted to give special recognition to one of your employees who became a huge resource and partner to making this trip a success! There was a woman named Karen who personally assisted my group of 13 students during our visit this past September. Upon our arrival, she greeted our group with a positive attitude. From setting up the initial appointment to actually working with the kids during the trip, she was such a kind individual. She gave our group a personal tour, pointing out all the different kinds of fabrics that are sold, taught them how to read a bolt, how to have the fabric cut, how to read a pattern packet and highlighted many of the accessories and embellishments available. Her expertise and knowledge with sewing was a huge part of this trip being so meaningful for the group. She went well beyond her role at this store and wanted to make sure she is recognized. Thank you again Karen!